Racer Tech’s Polaris RZR XP 900 Radius Rod Kit will replace the weak factory radius rods with a substantially stronger design. Here’s the fix for the weakest link on the RZR XP 900. These Radius Rods are a direct bolt-on replacement and work with the OEM trailing arm and knuckle/spindle. They are 1.25″ dia. x .095″ 4130 cond. 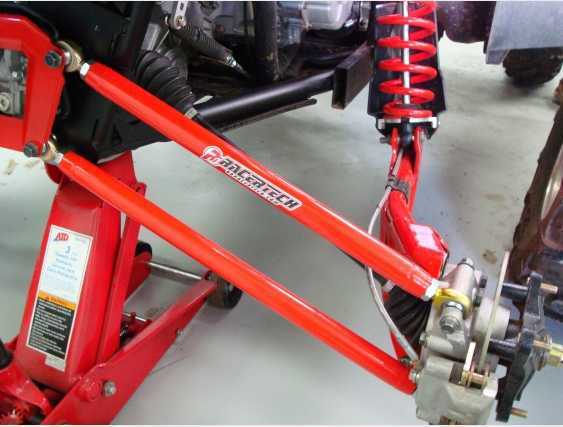 N Chromoly and use 5/8″ FK heim joints. The lower rod is designed to be a fixed length by turning the heims all the way in so they bottom out on the nut. This will help reduce issues with setups gone wrong. The upper rods have a little room for adjustments for the inclined rider to tweak the handling a little bit if desired. The adjustment provided from this kit is the static camber settings. By adjusting the rear camber one can control how aggressive the bite of the rear tire is in a corner and find a preferred balance of understeer / oversteer which is how much the machine pushes or slides out in a corner. This setting while controlling handling going into a corner, can also fine tune traction coming out of a turn. This kit includes the chosen radius rods, heim joints and high misalignment spacers needed for installation. The factory bolts are re-used and there is no modification to the vehicle necessary.